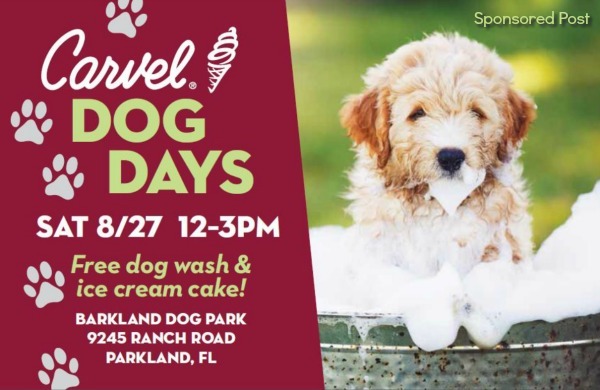 Dog lovers, bring your dog for a free bath while you treat yourself to America’s favorite cold and creamy summer treat: Carvel Ice Cream cake! It’s going to be plenty of fun, and when you attend be sure to share photos of your freshly washed pup using the hashtag #CarvelDogDays and you could win a custom cake with your dog’s photo! Noon til 3pm at Barkland Dog Park, located at 9245 Ranch Road in Parkland, FL 33067. Click HERE for map and directions. Open to the public (even those who don’t have pets!). Ice cream cake and dog washes are free and available on a first come, first serve basis. Craving some ice cream cake already or have a special event of your own coming up soon? Carvel Ice Cream Cakes are the perfect treat to celebrate every occasion or no occasion at all – from birthdays and backyard barbecues to date night for two and holidays – like National Dog Day! Visit Carvel.com to find your local Carvel Shoppe or Grocery Store Partner.